An ultra-right populist just won the presidency of Latin America’s largest country. Jair Bolsonaro’s promise to drastically ramp-up security, end corruption, and promote traditional family values resonated with Brazilians fed-up with years of government mismanagement, scandal, and spiraling crime. One thing is for certain: the torrent of digitally enabled fake news, in a country where the majority of the population claim their primary source of information is Facebook and WhatsApp, polarized the country. Although foreign policy issues were given short shrift during the 2018 election, Bolsonaro intends to unleash the most dramatic transformation in Brazil’s posture since the restoration of democracy in 1985. For one, Brazil could see a reversal of its traditional multilateral stance and support a multi-polar balance of power. Bolsonaro has signaled his disdain of the United Nations—describing it as a meeting place for communists—and his intention to withdraw from the UN Human Rights Council. A recently converted Evangelical, he also announced his intention to move the Brazilian embassy to Jerusalem. To cap things off, the head of Bolsonaro’s party denounced the Organization of American States (OAS) as part of a globalist conspiracy. It’s conceivable that Brazil may even opt to join NATO, unthinkable just a few short months ago. As we sift through the burning embers of the presidential campaign, what are some of Bolsonaro’s key foreign policy priorities after he assumes office in January 2019? One of Bolsonaro’s most consequential foreign policy shifts is already in motion: the tightening of Brazil’s alliance with the US. The incoming president and his offspring, three of whom are elected politicians, openly revere Donald Trump. Bolsonaro has surrounded himself with like-minded advisers. A candidate for foreign minister, Ernesto Fraga Araújo, a career-diplomat, has written a short treatise against globalization and praising Trump’s defense of Christian values against Islamism. Bolsonaro’s open support for the US—and validation of Trump’s positions on trade, rights, the military, and the environment—is in contrast to virtually all previous administration in Brazil’s history. Steve Bannon has lavished him with praise. And in his congratulatory call to Bolsonaro this week, Trump said he looks forward to tighter cooperation, particularly on security matters. Throughout the campaign Bolsonaro also spoke frequently of possible regime change in Venezuela. In this, he differentiated himself from previous Worker Party administrations that considered Hugo Chávez and Nicolás Maduro strategic allies. The outgoing government of Michel Temer took a less kind stance than his predecessors, working with Latin American countries and the OAS to isolate the Maduro regime. However, Temer studiously avoided talk of military action or Brazilian support for US and European penalties (claiming that the UN Security Council was the only body that could legitimately impose such measures). But with more than 56,000 Venezuelan refugees seeking sanctuary in Brazil and Bolsonaro fanning the flames—describing refugees as “scum of the earth,” the possibility of economic sanctions and even military action cannot be discounted. Bolsonaro will likely pack his cabinet full of former generals and is keen to expand the army’s role in domestic security across the country. Bolsonaro will seek to expand trade, albeit mostly through bilateral deals and a transactionalist “Brazil First” approach. A staunch protectionist for most of his 27 years in politics, Bolsonaro softened his tone before and during the presidential campaign. He won over much of Brazil’s financial elite by bringing in Paulo Guedes, a US-trained economist, as a would-be economics “super” minister. Guedes has said that pension reform, privatization, and lower taxes are his priorities, prompting stock markets to soar after Bolsonaro handily won the first round in early October. Along with Guedes, he has a dim view of multilateral free trade, including the South American customs union, Mercosur, though they are said to favor the free-trading Pacific Alliance. In contrast to previous presidents, Bolsonaro has also singled out the BRICS group for criticism. Even as Bolsonaro pivots to the US, there are signs that he is likely to push back on China. China is Brazil’s largest investor, having overtaken US as the country’s largest investor in 2015. In 2015, Chinese President Xi Jinping committed to doubling two-way trade to $500 billion within the decade. He also said Chinese investment could increase by another $250 billion by 2020. Once confined to commodities and manufacturing, Chinese firms are busily expanding into logistics and renewable energy. Bolsonaro clearly intends to roll-up the red carpet that his predecessor, Michel Temer, laid out. In what one journalist described as an anti-China rant, Bolsonaro said “China is not buying in Brazil, China is buying Brazil.” Chinese diplomats are looking nervously on. This is a radical departure from Brazil’s previous stance as a major backer of multilateral efforts to reduce climate change. Meanwhile, Bolsonaro is flirting with the idea of merging the environment and agriculture ministries and stripping funding from environmental protection agencies. Brazil’s massive agri-business, construction, and mining lobbies are salivating at the prospect, as are extractive companies around the world. The consequences for the Amazon, and global climate change, are dire. In his campaign manifesto, Bolsonaro promised to step-up the fight against organized crime at home and abroad. While offering few concrete details, in recent calls with US Secretary of State Mike Pompeo he confirmed that he will support tougher measures to counter transnational criminal groups. Some commentators describe his domestic stance on drug policy as draconian, singling out his staunch opposition to decriminalization and measures to ratchet-up police and military action against anyone suspected of involvement in drugs. The new administration will likely expand regional counter-narcotics efforts, particularly along the Bolivian, Colombian, and Peruvian borders. When it comes to global drug policy issues more generally, Brazil’s incoming administration will likely do what the US tells it to. There are good reasons to take Bolsonaro at his word. The executive branch exerts considerable control over foreign policy, including the ministry of external affairs, with comparatively limited inputs from Congress and the Senate. What’s more, Bolsonaro has strong support from his PSL party and will work to build partnerships with lower-level politicians from lesser known parties in Congress who will seek to align themselves to gain influence. While his immediate focus will be on pushing through public security and economic (and later social policy) reforms, he can earn a number of easy victories on the foreign policy front and satisfy his base by delivering on his commitments. This will be especially tempting given the many domestic challenges facing Brazil—not least a faltering economy, high levels of unemployment, and entitlement reform. It can be tempting to dismiss Brazil as an inconsequential player in geopolitical affairs. While a Latin American goliath, the country punches well below its weight in diplomatic and military terms. Given its size and economic output—and despite its geographic and linguistic isolation— Brazil should be a heavyweight. The country accounts for 40 percent of Latin America’s population and roughly the same share of its regional GDP. Yet the world’s fourth largest country by population and eighth by economy has not been a major presence on the global stage for years. This may change. 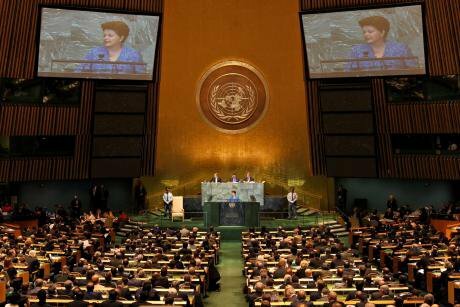 Brazil could help put the brake on global multilateral action—particularly on issues related to protecting the environment—at precisely the moment when the world needs enlightened leadership. Make no mistake, the incoming government’s posture on issues ranging from climate change to open trade has global implications, not just for the region, but for the world. This commentary is written in the author’s personal capacity. This article was poreviously published by The Global Observatory. Read the original here.